At Stacklist, we are constantly in need of graphics, whether it’s for social media or our articles. However, like many other early stage startups, we don’t have a dedicated graphic design person and none of us have a design background. We’ve found that DIY tools are the way to go. These tools are made to have an easy and engaging UI. They offer enough customization that the user is in charge of the final product, but enough restriction that the design is likely to be very good, regardless of a user&apos;s design experience. So, we’ve compiled a list of some of the best DIY design tools you should be using today. These tools will help meet your design needs and enable you to put forward a more compelling brand image across mediums. Try them out, and enjoy! Canva is a great all-purpose design tool, helping you out in every facet of graphic design. Canva makes even the most complicated elements of design easy, opening the door for even the least experienced users to create something great. Canva is the most popular DIY design tool we’ve come across and receives rave reviews. We use Canva for some of our graphics and especially like its UI. 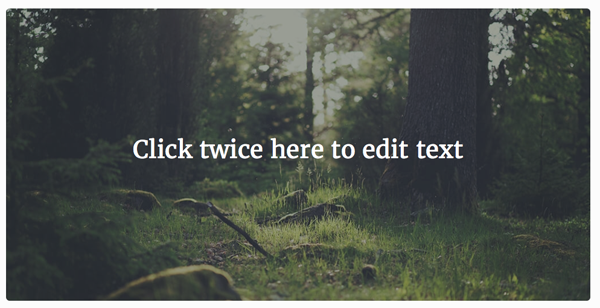 Canva has a great drag and drop feature that makes editing images easy. You can also with the click of a button add text to photos, helping you make posts for social media and infographics. The design grids make sure that your images are always set the way you want them to be, saving a lot of effort. Most useful is the fact that Canva does wireframing, setting up the skeletal outline of your pages. Pixlr is one of the most straightforward and easy to use DIY design tools we’ve come across. Additionally, it has a mobile editor, so you can work on the go. Pixlr boils down the complexity of Photoshop into an intuitive interface with boundless capabilities. From Pixlr, you can thoroughly edit any image to your liking, creating striking and memorable graphics that customers will remember. Pixlr has 20 different adjustment features, more than enough to alter images to perfection. These include options such as Splash, which adds a splash of color, Brighten, which lightens the images, and Airbrush, which is really useful if you’re working with images of people (in researching this article, I airbrushed 20 years off our presidential candidates). You can also add over 100 effects and 200 borders. You can use 340 different overlay images (though not hopefully at once), which results in stunning effects. Like Canva, you can add type over the images. 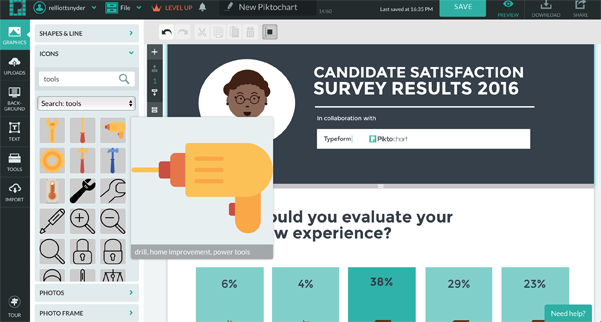 Piktochart is an establishment favorite when it comes to infographic tools and appears on many best design tools lists. Piktochart is great if you need infographics, reports, and posters. Piktochart lets you design unique creations, with over 500 templates, that will impress both consumers and other business leaders and founders. To begin, there are a ton of free templates to choose from (and even more in the pro version). You can edit existing templates to meet your own specific needs. Additionally, you can add shapes, icons, lines, and photos. The real standout feature is the photo frames, where you can drag any image into a custom frame, shaping it to that border. In this manner, you can create beautiful images that not even the most advanced photo editor could accomplish. Pricing: There is a free editor. The lite package costs $15/month, and the pro version costs $29/month. Venngage is the new kid on the block when it comes to infographic design, and we’re fans. Venngage is all about infographics. They have hundreds of elements and options to choose from to make sure you are getting the most impact you can out of your graphics. Venngage is based on a 3-step process: choose a template, add charts and visuals, and customize your design. By streamlining the process, Venngage makes crafting infographics that much more simplistic. Like Canva, there is a drag and drop feature that is so often seen in DIY design tools. Venngage also allows for easy sharing, so customers can see your designs. Pricing: There is a free option, but it’s limited. The premium package will cost $19/month, and the business package costs $49/month. Pablo by Buffer is perfect for you if you are designing for social media channels. Posts with images do much better on social media than those without, and Pablo is built specifically to boost your engagement and reach. It integrates seamlessly with Buffer and social media channels, so you can push out your content more easily. Pablo has over 600,000 images to choose from, so you always have the picture you need. It also has a ton of preloaded quotes if you need some inspiration. It is also helpful for making logos. While there’s no drag and drop feature, it’s still simple to use. The most important feature is that you design an image based on the channel you will be pushing it out on. Pablo will adjust the image size, so there’s no unwelcome surprises later.